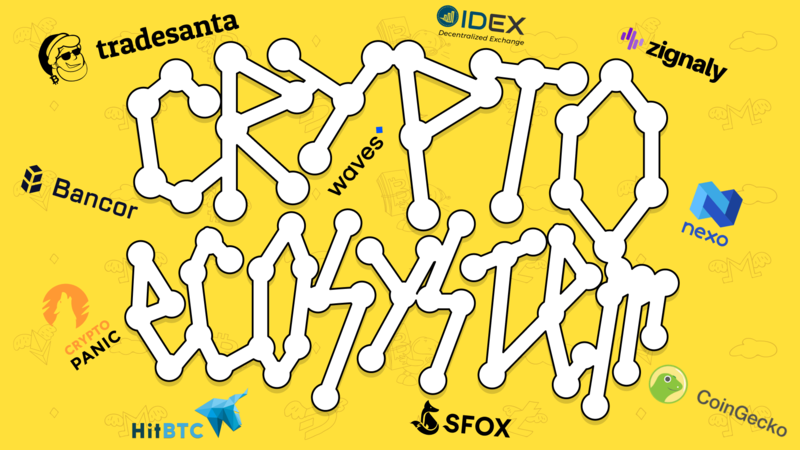 Cryptocurrency ecosystem is almost limitless and made up of various elements, which, in their turn, compose own ecosystems. This article allows you to plunge into the world of crypto trading, find out what tools and resources traders use to analyze the crypto market, what components cryptocurrency trading ecosystem consists of. We have highlighted the main components and provided the information identifying their major functions and key market players. The foundation of the crypto trading ecosystem is an exchange. Currently, there is a wide range of existing exchanges, and their number is increasing rapidly. We can divide exchanges into two main categories: centralized and decentralized. The structure of centralized exchanges is similar to traditional ones: there is a main authority that keeps all the records and takes commission. The key difference of decentralized exchanges is peer-to-peer transactions through blockchain. You can read more about centralized and decentralized exchanges in our articles. Most cryptocurrency commercial transactions are conducted on exchanges. At the same time more and more exchange services are appearing on the crypto market, claiming that “buy & sell” operations can be much easier and faster. Exchangers allow crypto-holders to change either cryptocurrencies (e.g. BTC into ETH) or fiat to crypto currencies (e.g. pay by debit/credit card and get almost the same amount in BTC). Key difference between trading exchanges and exchangers is that cryptocurrency exchange services provide their platform for trading and mediate between buyers and sellers. While trading on the exchange, you are dealing with real owners of crypto assets, as you are. On exchangers, trading operations are conducted not with other users, but with the exchanger itself. Usually, the commission fee is fixed and set by the exchanger. 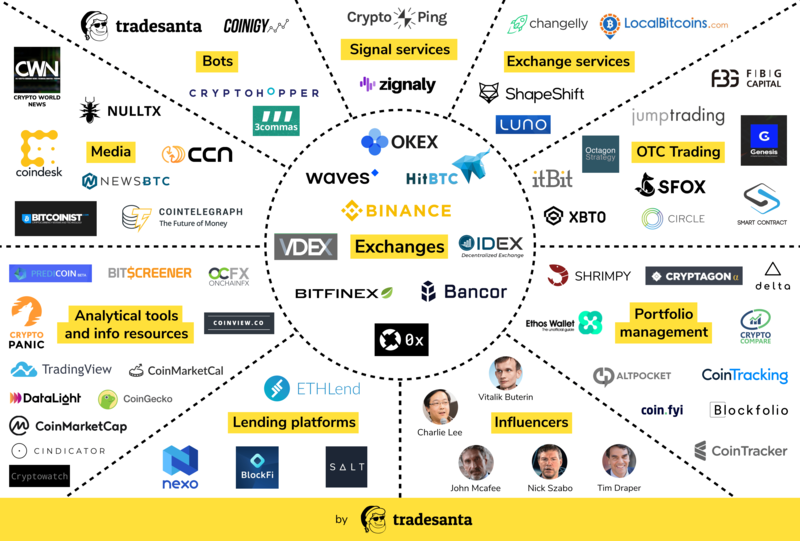 The most popular exchangers are Changelly and ShapeShift. The demand for instant cash among crypto traders and investors has caused an appearance of financial services called “lending platforms”, or “crypto loans”. They allow crypto holders to deposit their cryptocurrencies as collateral and borrow fiat money instead. Due to the high volatility of crypto markets and Bitcoin price’s ups and downs, the concept of lending platforms probably will not reach the highest peak of popularity, however, there are still some well-known crypto loan services, such as SALT, NEXO and ETHLend. Over-the-counter or OTC desks provide crypto buyers and sellers with ability to purchase crypto assets in large amounts. However, such significant trades on exchanges may cause a sharp price growth. OTCs help to avoid it, enabling customers to get amounts from the particular exchange without causing much turbulence on the cryptocurrency market. OTC desks are useful for so-called “whales” who trade large amounts of crypto. Some major exchanges, including Bittrex, started to launch their own OTC trading desks, making the trading process more convenient for big market players. Examples of the most popular OTC desks include itBit, BitPanda, Unocoin and Xapo. Nowadays there are many bots that are actively used by crypto traders as a supporting tool. Cryptocurrency bots may have different purposes, like signalling when is the right moment to enter the market for starting a new deal and notifying you when a cryptocurrency has some changes on the market, or automating trading process. First, let’s have a look on crypto trading bots. There are many options of such bots on the market, and all of them vary in terms of quality, profitability and subscription fees. Crypto bots can be a free software for everyone, both beginners and pro traders, like TradeSanta, or they can be a bit expensive and you will need to get a subscription, but it is mostly needed for professional crypto traders. To enable bots to execute trades on exchanges on your behalf, you just need to set specific parameters. Some trading bots also allow usage of exterior signal services. In order to stay updated with rapidly changing crypto market, traders have to monitor and analyze the latest news and real-time information. So far, the most popular crypto trading tool is TradingView . The site mainly focuses on technical analysis of different charts, providing great number of indicators, and is considered to be a perfect tool to start with. Moreover, TradingView also serves as a social media platform, where professional traders can share their experience and strategies, while beginners can learn from experts. Сryptocurrency trading requires to be aware of everything on crypto market. Fortunately, it is widely open and easily accessible. The most essential and useful information source for traders and investors is CoinMarketcap. You can find overviews and other necessary information about all cryptocurrencies and exchanges. It provides you with graphs for each coin, its market cap and volume for the past 7 days. Crypto world continues to grow day to day whereas crypto markets are still in the early stages with much smaller share of the market makers that results in the fact that news has a profound impact on cryptocurrency trading. To be aware of the latest tendencies and always acquire real-time information, traders need to monitor and surf a wide range of sources. However, at the start when you take a deeper insight into this domain, you can be confused by the large amount of options and face the problem of validation. To make it easier, the main players in the news realm are specialized media or platforms such as Coindesk or Cointelegraph. Also, you should pay close attention to crypto influencers, thought leaders and experts since they not only provide valuable insight, but sometimes can affect a token’s price through their comments. As a first step, it’s better to follow widely accepted media and influencers who have proven authority on the crypto market scene. Keeping track of all investments might be a difficult job, primarily for active traders. At some point it is necessary to get all coins in one place. Portfolio management apps help not only to monitor the portfolio, but also to check the investment’s performance. They allow to see the accurate statistics and profit/loss information about investments. There are several apps that are commonly used by most cryptocurrency traders, some of them are free for personal use, like Gem and CryptoCompare, while others have paid plans like CoinTracking and Blockfolio. It should be noticed that Blockfolio is the most popular mobile app amongst traders and investors. It has a vast number of options, including newsfeed, large number of coins and customizable interface, so users can customize it according to their preferences. The list of examples can be continued even further, but as we mentioned in the beginning, we highlighted the most significant cryptocurrency trading resources and tools, that are popular among many traders.